It’s Memorial Day and because I have vowed a blog will appear on Mondays, I am writing this even though I will be lucky to finish it by midnight. And since it is Monday and Memorial Day, I am going to focus on the mentors I’ve been lucky enough to have in my life as I encourage other writers to take into their hearts those who approach them asking for help with their writing. I’m living, breathing proof that it doesn’t take much to keep a neophyte writer going. It also takes very little to discourage talent, perhaps driving it away forever. My first mentor was undeniably my mother. She was a writer at heart, but five children depleted her of the energy and self confidence that might have put her on literary maps. Her blessing to me was an extraordinary command of the English language and a love of books. I had a mother who read to me and that is invaluable. My second mentor appeared from the sheer dumb luck of my marrying her nephew. Dorothea Warren Fox was a magnificent, magical person, but she was also an artist and wordsmith. 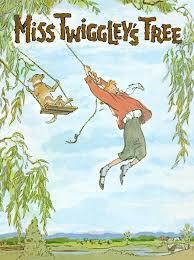 Most households of her era had a copy of the Dr. Spock she illustrated and her Miss Twiggley’s Tree won the Parents’ Magazine Press Award. Dottie had the ability to find art in almost anything, even my five-year-old son’s black trees, with black, barely discernible, leaves. “Oh, look at that lovely tree,” she said. “How did you ever think to paint it that brilliant color?” Our son beamed, and Dottie had again waved her wand and turned a frog into a prince. She loved whatever I wrote and whatever I did. It was only at her funeral that I realized all the people there had had the same experience. Each one thought she loved them best and found them the most wondrous. Still, no one in my life convinced me as quickly that I could do anything. She was, as everyone says, one-in-a-million because she was generous with her time and her praise. She knew that you never have to worry about someone getting too much acclaim. You can count on some dark force to come along and slap the confidence out of you. The miracle people are those who see the genius in the ordinary. Dottie was one of those people. 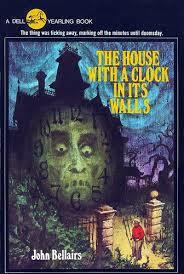 My son and daughter both loved the eerie, well-written, quirky mysteries of John Bellairs. I loved them too. In fact, I loved them so much that I called Bellairs one day. No guts no glory, I thought. I wanted to tell him how much I appreciated the fact that he had strong boys and girls in his books and that the vocabulary was rich and challenging while the stories were creative. Right away, he answered, and right away I knew he was lonely. He was the Lewis of his stories. He was also kind. He took to returning my calls, asking about my family and my children. He even read the story I was working on and had both praise and some constructive criticism. He was funny and human. He talked about growing up in Marshall, Michigan, not far from me, and about the odd house on which he based one of my favorite books The House With a Clock in Its Walls. He died too young, but not before he left an indelible impression on me and on the thousands of children who read his books. In his book The Secret of the Underground Room is the inscription: To Lyla a Good Friend in a Difficult Time. It’s a touching sentiment, but in truth John Bellairs did so much more for me than I for him. He convinced me to keep writing late at night and early in the morning (easier for me at night) and not to be discouraged. I have saved my most constant mentor for last because it will hard to write this. Betty Horvath, who wrote the groundbreaking Jasper books, featuring a young black boy with big dreams and ten other children’s books reprinted in most basal readers, was my friend for over thirty years. Because she went to my Episcopal church and because I wanted to meet her, I made sure I got into a “small group” she was in. I think you can probably go to hell for such calculated moves, but I was a young mother at home with a six-year-old and a baby and still yearned to be a writer in my spare time. Betty was a legend in our town and our church. I wanted to sit at her feet and learn from her. I did. She was a self-effacing member of Mensa who painted fabulous pictures with words. Out of her mouth flowed such gems as, “Trust in the Lord, but tie your donkey.” She kept me laughing and learning. Even at the end of her life, those last eight plus years spent in an assisted living place near her son in Minnesota, she was upbeat and writing stories she never intended to publish. Betty taught me what may be the most important lesson I learned: you are a writer if you write, not if you sell or publish, but if you write. Some of Betty’s stuff will be seen by only a few, but it was brilliant and hilarious. The reason this is hard to write is that Betty’s birthday was a few days ago, but she died a couple of months before that. Up to the end, I received witty, interested emails, and I could tell her that my second book had been bought and that it was dedicated to her. I read the dedication over the phone: Dedicated to Betty Horvath, my very own Charlotte A. Cavatica, a true friend and a good writer. She paused after I read it and said, “I hate to sound stupid, but exactly who is that?” I reminded her that the Charlotte of Charlotte’s Web had a full name. It was Charlotte A. Cavatica. So on this Memorial Day besides remembering the magnificent men and women who live and die keeping our country safe, I am also thinking of the heroes of my writing life. Leading that list is Betty Horvath who was indeed a true friend and a good writer. This entry was posted in Cozy Cat Press and tagged bellairs, horvath, mentor, writing by Lyla Fox. Bookmark the permalink. Very touching….It is amazing at how much I just learned in these short paragraphs. I found your memorial by searching for “Bellairs” today on WordPress. I’m not sure why, today, so soon after you wrote this lovely entry – but it was a sweet coincidence. J.B. has inspired me since my childhood. I’m so touched that you thought to contact him and become his friend. I hope he knew how much his books meant to us, all the Lewises and Rose Ritas out there.